Hi, my name is Dawn and it would be my pleasure to be your travel agent! My first trip to Disney was the summer after it opened, in 1972. While my memories are vague (except I clearly remember thinking the hitchhiking ghosts from Haunted Mansion were coming home with me), I believe that even then I knew I had a dream that involved Disney. But if you’re like me, you know life happens and dreams sometimes get buried under the busyness of life. But even in my busy life, this dream kept coming back like a welcomed friend – on my spring break trip in college and two family trips when both of my daughters were around 6 (what I deemed the perfect Disney age then, but now I’m an advocate of 50 being the perfect Disney age!) But seriously, the fun thing about Disney is that every age and every life stage is the perfect time in life to visit Disney. About 5 years that the dream got rekindled and I knew that no matter what, I needed to let go of the fears that come with major life changes and I started working toward a Disney career. I spent every day reading about Disney (and I’m not exaggerating, every DAY!) and weekends watching Disney Youtubers exploring the resorts, parks and neighborhood attractions. I went to Disney World over and over again, trying new resorts, restaurants, experiences every time! I was even lucky enough to land a job doing some editing and writing for a Disney blog and a Disney book, and it still wasn’t enough. My amazing travel agent at Pixie Vacations saw that this wasn’t just a passing fancy of mine. I was obsessed with Disney and helping friends become obsessed. She offered me the chance of a lifetime, to become a Disney travel agent, so here I am, in my 50s, starting a whole new career, but it’s more than that. It’s my passion, 100% of the time with 100% of my heart. And I want YOU to join me. I’ve found ways to do Disney on a budget (I’m a single mom working in a church so I know how to budget) and I’d love to help you and your family discover the joys of Disney no matter what your budget is. Big or small budget, there’s an amazing Disney adventure waiting for you. My services will always be completely free. 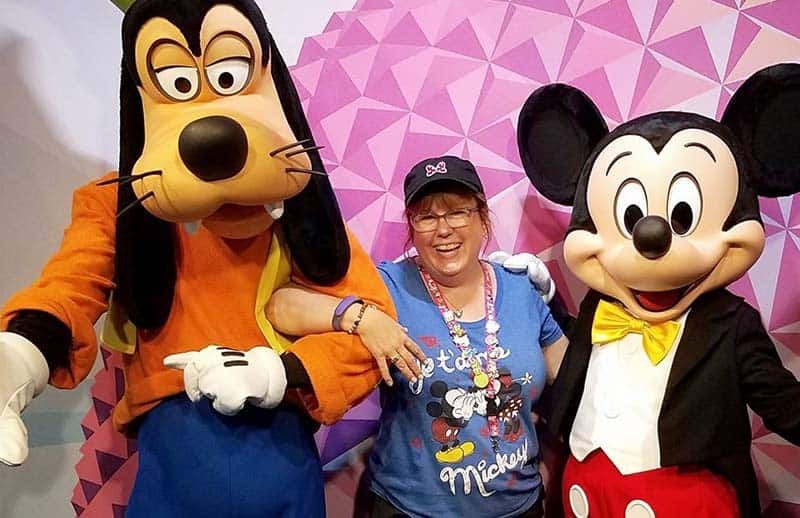 I’m here to help you discover the best way for your family to go to Disney (or for just you to go by yourself if you want to go on a solo trip to Disney – ask me for tips on this as I love Disney solo trips!) and create memories that will last a lifetime. Please select my name on the Disney quote form, or call me at 320-224-2487.